Flopsy the Chinese Crested powderpuff—his owner says, "He got his name because when he was a pup, whenever we stroked him he would fall over and lie there waiting to be pampered." 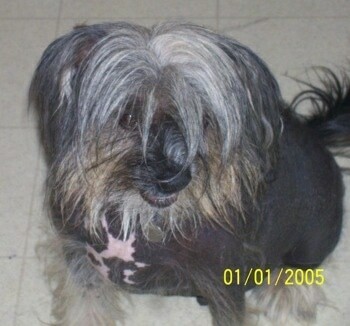 "This was my Chinese Crested Hairless Joey aka Joe. He was my baby; the sweetest most protective dog that I have ever had. He was very smart. He knew how to "sit" "stay" "catcha kiss" "piggy back ride" "lie down" and "roll over"—anything that I asked him to do, he did. He stood still for baths. The best dog in the world.... (Rest in Peace, sweet boy)"